I have just begun reading the recently-released book of the interview Pope Benedict gave to Peter Seewald during the summer, entitled Light of the World. Not too far into the interview Seewald asks the Pope how he prays. In light of the fact that the Pope is, and has been for decades, a first-rank theologian, I was half expecting a weighty and perhaps even complex approach to prayer. Instead he is as direct and to the point as it is possible to be, and reveals a beautifully simple and authentic prayer life. To the person familiar with his writings both as theologian and as Pope it becomes clear that the spirituality of his theology is distilled to its essence in his prayer, which is situated right in the heart of the Church as the communion of saints, and its rich and profound traditions, focused on the Lord with whom he relates as “by old acquaintance”. 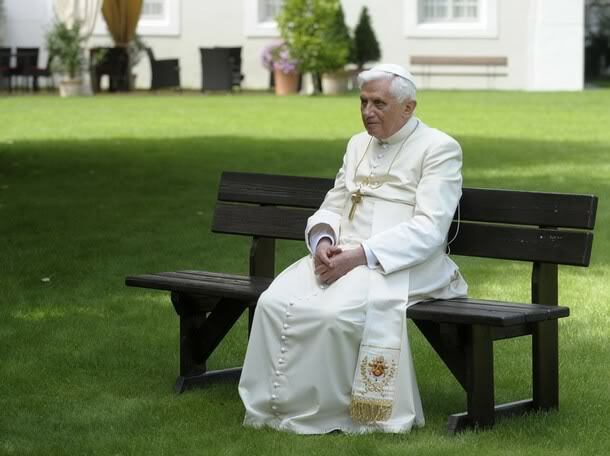 Given his relative isolation from close acquaintance as pope, it is no wonder that Pope Benedict turns especially to the saints, fellow members of the Church, unseen but ever-present, and not subject to the security measures necessary to keep popes safe nowadays, measures which sadly must tend to breed loneliness. Pope Benedict reminds that us in the Church, though no other person be physically present with us, we are never alone. Prayer attunes our spiritual senses to recognise the saints and angels who are always at our side to encourage us, to listen to us and to pray for us to God in whose very presence they live. Previous Post Ave, gratia plena!